Wax Latex Mud #1, 9 August 2009, Espaço 104, Belo Horizonte, Brazil. Dirk Jan Jager is best known for his work as a painter, however at the invitation of the organizers of MIP2, the Brazilian international performance art manifestation, he staged a new performance work Wax Latex Mud. This new work extends an ongoing investigation into the body as an extension of Jager's painting practice: in which he stages himself as the Anonymous Body. This body aims to exist in a state of neutrality equivalent to that of the fresh canvas or the white cube. Of course the body is never entirely anonymous and thus through the work itself and the gaze of the viewer mediated by the artist it becomes a site of transgression. Previously this work existed as closed performances, the artist alone with a camera caught in closed circuit anti-narratives. With Wax Latex Mud the action goes public, the physical enclosure regulated by the aperture of the camera mechanism removed. Time plays a significantly different role in this work, along with the actual presence of audience duration and endurance enhances the vulnerability of the body. 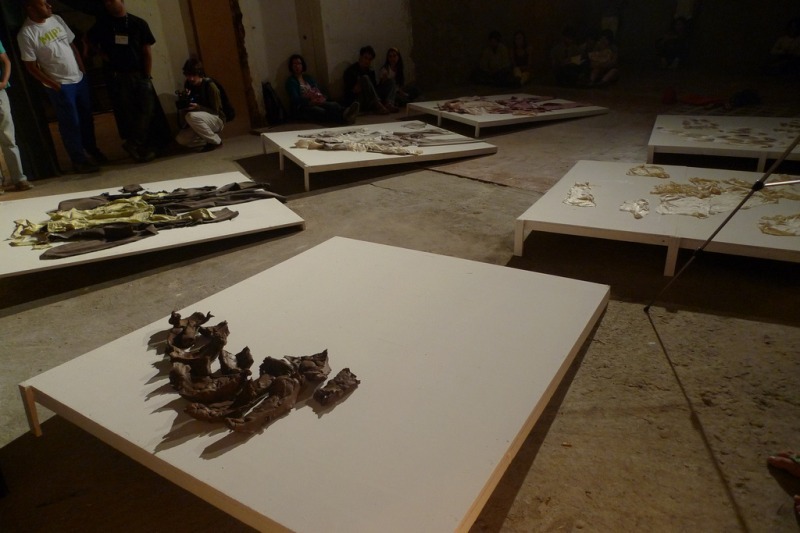 Over three consecutive nights the artist undertakes a journey of transformation. Though this process recalls in some respects Joseph Beuys’ tale of rescue by Tarter tribesmen, Jager's action connects directly to the history and culture of the country where the work unfolds. First he undergoes a full body depilation or Brazilian wax, the ritualistic action is then repeated over the following nights using first liquid latex from the Pará rubber tree Hevea brasiliensis, and finally clay. At the beginning of each stage the artist appears in a suit, which was cut off of him by assistants, although these sometimes very painful actions of stripping, burying and coating can be seen as reminiscent of universal Jungian warrior archetypes found in Africa, Asia, the Americas and the European ancient world, Jager refreshes and subverts them with an intense presentation of a hyper-vulnerable Artaudian body without organs: in a disused building, traffic humming through the warm night in the middle of a bustling Brazilian city on the equator, called Beautiful Horizon. From July 20th to August 9th 2009, CEIA, Centro de Experimentaçao e Informaçao de Arte, produced the event MIP2 – Manifestaçao Internacional de Performance, which included two weeks of workshops and a week of live presentations, lectures, round tables and a video-performance program.